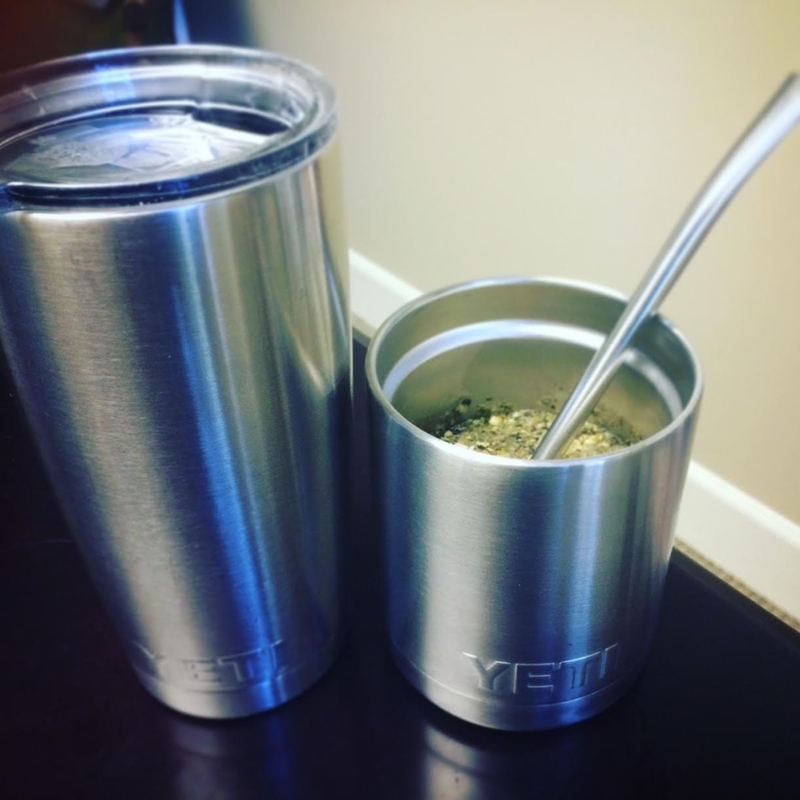 Here’s a weird stocking stuffer idea for Christmas: the Yeti Yerba Mate kit! It’s an off-menu combo item, if you will, but it ends up being pretty slick. If you’ve ever been down to Argentina, you know yerba mate (pronounced “sherba mah-tay” by Argentinians) is pretty much right up there with Malbec as the national drink. Starting as a shrub similar to the tea plant, the leaves are smoked in a wood burning fire, very much like how they barbecue lamb “asada” style. The leaves contain mateine, a close chemical relative of caffeine, and the amping effect is about the same as tea (i.e. slightly weaker than coffee). Argentinians drink mate differently than we do tea, however. First, they don’t use tea bags; instead the loose leaf (or “yerba,” meaning herb) is poured into the cup (or “mate,” the technical name for the gourd they make into cups), and then–while the leaves are still dry–they shake the cup at an angle, making the leaves slope inside the cup. This allows them to slowly wet out more and more mate with successive short pours of boiling water, allowing for a nice mellow drink without overdoing the strength of the tea. But how, you may ask, do they actually drink it with all those leaves in it? A ha! The key is the bombilla, a straw with a strainer on one end which ultimately serves the same purpose as a tea bag. So, to make the ultimate modern yerba mate kit, you need four things (1) a mate or vessel in which to make the drink; (2) a bombilla straw; (3) a “thermo” or vessel to separately carry hot water, and (4) finally, of course, you need the yerba mate itself! Well, I’ve done your work for you, and I have (really, accidentally) assembled the perfect modern Yerba Mate kit. First you need the Yeti Rambler 10 oz. lowball, which is perfect for easy mate making. Next, you need a matching modernist bombilla straw, which is actually super cheap on Amazon. Then naturally you will want a matching thermo, i.e. 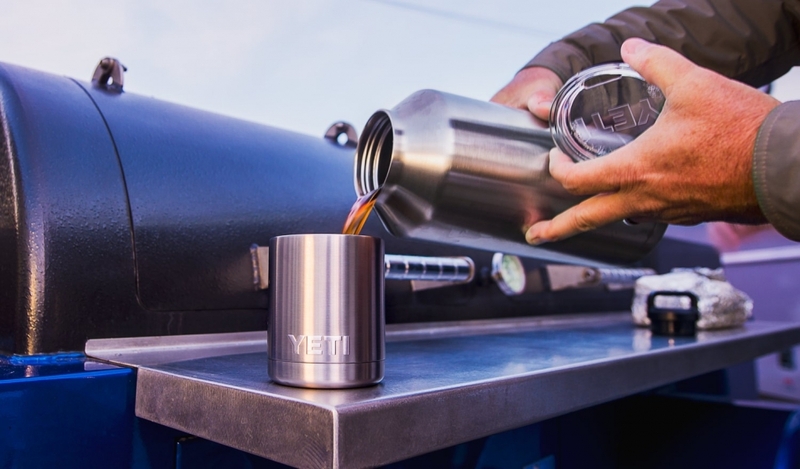 the Yeti Rambler 18 oz. bottle. The end process is much like what you see above, except you use the bottle only to hold hot water. Obviously to pull this off you’ll also need the leaves themselves, and I recommend Guayaki-brand, which is surprisingly widely available in stores like Whole Foods, in addition to being available online. This isn’t a traditional kit, mind you; for that you need a proper mate gourd, but in terms of ease of use and stripped-down style, it’s pretty hard to beat. I'm the owner and editor of The Itinerant Angler and the host of the podcast. I'm also a national print magazine writer and photographer, providing content to a wide variety of publications. For more information, please check out the About page. If you need to contact me, please email me at ZachMatthews@gmail.com. 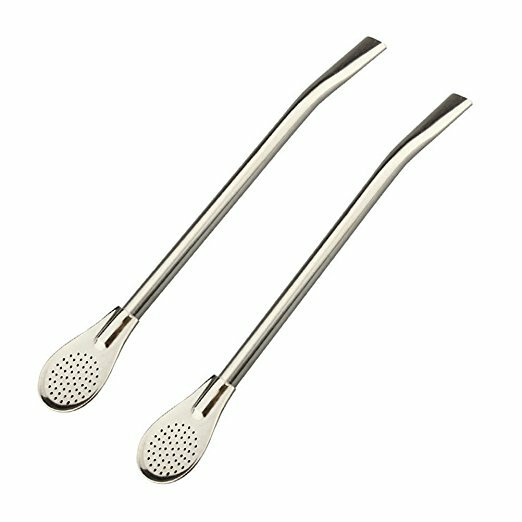 One Response to "Yeti Yerba Mate Kit"
I always wonder about non USA stainless steel products, like the Bombilla Straw. Please be sure to check out the Board and Photoblog. itinerantangler This week on the Podcast: author, environmentalist, Yellowstone legend and founder of Blue Ribbon Flies Craig Mathews will be our guest! itinerantangler @cardiganhunter @patagonia Same issue here. Paxton Hill on Why Does Yeti Get Ripped Off All the Time?